We wish to thank all our faithful friends and Networked blog followers for your continued support. We will no longer updating our opheartprints.blogspot.com. 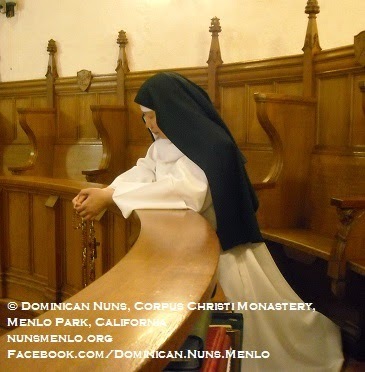 If you wish to continue receiving our monastery news and reflections, please go to: http://www.opnunsmenlo.org and enter your email address to subscribe to our Website. You'll automatically receive notifications of new posts and reflections by email. A young woman spent the night with her desperately ill mother before the relics of St. Agatha. Tired from their vigil, they both fell asleep. As the young woman dreamed, St. Agatha appeared to her and told her two things: First, her mother would be healed, and second, she (the young woman) would die a martyr. Waking from her dream, her mother was cured and allowed the young woman to consecrate herself to God. The young man who had hoped to marry the young woman was bitterly angry and brought her before the government on charges that, if she was convicted, would mean a gruesome death. She was found guilty of being a Christian and was burned at the stake and stabbed through the heart. A terribly tragic story…or is it really? Looked at through the eyes of faith, we can also see in it a beautiful love story. This was the story of St. Lucy, whose feast we celebrate today, handed down to us through legend. Because of her devotion and love for Jesus, she was willing to sacrifice even her life on earth rather than deny Him. As a result, she is with Him for all eternity. Now, how many love stories in Hollywood have as an ending joy and happiness with one’s beloved for all eternity? The mystery of St. Lucy’s decision to abandon marriage for love of Christ and consecrate herself to Him is still with us today. Too often, we are confused about love –movies, books, and songs mistake romance and lust with love. We are left with the impression that love is about roses, physical passion and hearing grand swells of music whenever our loved one is near. But flowers wilt, romance gives way to the reality of daily life and sometimes the music of life strikes our ears as just plain noise. It is then we get to the reality of love – love is an act of the will, to will the good for the other. Sometimes, often, we must make sacrifices and hard decisions. Only then can we say we have truly loved. This is the reality of love no matter to which vocation God has called you. We are all called to love, to become holy. Then, the question of discerning your vocation becomes “how is God calling me to love?” For humans, the married life seems more natural and considering the priesthood or consecrated life is more dramatic, shocking even. With married love, we often may gloss over the struggles and sacrifices required to make marriage work. A young couple goes to the priest with doe eyes for each other, yet hasn’t considered the work of marriage – how will they be good stewards of the money they earn? How will they raise their children? Suddenly, they may find themselves far apart on critical issues foundational to marriage. Then there are the daily sacrifices and observances required to love one’s spouse. A marriage may not have a formal rule like a consecrated community, but to be sure one must be willing to sacrifice their own will for the good of the other if the marriage relationship is to survive and thrive. You are one of God’s people, of God’s family, a virgin among virgins; you light up your grace of body with your splendor of soul. More than others you can be compared to the Church… This is the person Christ has loved in loving you, the person he has chosen in choosing you. He enters by the open door; he has promised to come in, and he cannot deceive. Embrace him, the one you have sought; turn to him, and be enlightened; hold him fast, ask him not to go in haste, beg him not to leave you. The Word of God moves swiftly; he is not won by the lukewarm, nor held fast by the negligent. Let your soul be attentive to his word; follow carefully the path God tells you to take, for he is swift in passing. How is Jesus, the lover of our souls, calling you to Him? Through a marriage relationship? Ordained ministry? Consecrated life? Then do not be afraid! Fly! Keep your eyes on Jesus and do not look at the crashing waves the enemy would blast around you to keep you from Christ – stay faithful and God will resolve any doubts or obstacles in His time according to His will. Pursue Him, while He is still near. For the sake of Love! Are you, or do you know, a young, single Catholic woman? Join us for our upcoming “Come and See” Day on January 17th, 2015. Click here to learn more. Thirst drove me to the refectory after Compline. As I entered the cloister walk to cut across the garden, I paused in the middle and leaned back against St. Dominic to look up. Scattered across the deepening velvet sky like glittering diamonds were stars, periodically joined by the twinkling lights of a passing airplane. The daytime noises of flitting birds, bees and other creatures were gone, replaced by a sleepy hush that covered the cloistered like a blanket. As I looked around, I noticed the bell tower was being illuminated by a growing white light. As the light rose in the sky, still behind the opposite roof of the cloister, the shadows in the cloister began to lessen and silverly ran down the walls, down the pillars and into the cloister walk. Finally, above the roof and silhouetting a tall fir on the back side of the monastery, rose a brilliant full moon. Today we celebrate the Immaculate Conception of the Blessed Virgin Mary. What does that mean? Why is this important? By “immaculate conception”, we mean that Mary was conceived without sin, by the grace of God. When God made Adam and Eve, they lived in a state of holiness, of perfection. They lost this perfection for all mankind through their sin. Since that time, all people, until Mary, have been born in a fallen state, the state of original sin. But God did not intend to leave us in that state. He promised Adam and Eve, and others throughout the generations, that He would provide a Savior to redeem us and bring us back into a state of holiness. That Savior was to be God Himself – the second person of the Trinity, the Son and Word of God – He was to come to earth as one of us, and would be named Jesus. Mary, who was to be called by God to be Jesus’ mother, was given a “singular grace and privilege of almighty God and by virtue of the merits of Jesus Christ…” (Pius IX, Ineffabilis Deus (1854)) to be free and immune from the stain of original sin. How do we know this? The angel Gabriel tells us so when he refers to her as “full of grace”. To be “full of grace” is to be perfect. Sinless. Holy. Does this mean we are saying Mary didn’t need Jesus as her savior? Certainly not. Mary received this singular grace completely from Jesus Christ. 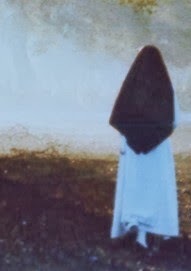 God, being outside of time and space and being, well, God, chose Mary to receive this grace because of Jesus – if God was so particular about the Ark of the Covenant, which to be His mercy seat on earth, what more fitting place for the Son of God to live and grow for nine months that in the womb of a sinless woman? The fact that Mary was immaculately conceived reveals more about God and His abundant love and mercy and His plans of salvation made available to everyone. As Jesus is the sun, Mary is the moon – reflecting the light of her Savior and Love, dazzlingly brilliant, to a world shrouded in darkness until her Son returns in glory. Blessed Virgin Mary, Immaculate Conception, pray for us! It’s often said being in the novitiate is a little like being back to school or being in boot camp. You leave behind a world that is comfortable and familiar and walk through the door to a new and exciting adventure with new people, rules and lots of opportunity to make fresh mistakes, learn and grow. This past week, we’ve been studying Venite Sorsum: Instruction on the Contemplative Life and on the Enclosure of Nuns, and Verbi Sponsa. There are so many beautiful things pointed out and described in these documents about the purpose and life of cloistered nuns. But one of the most palpable things people notice when they visit a monastery and which can so easily be broken, is the silence. We live in a noisy world. Our senses are constantly bombarded with sights and sounds. Our minds flit from social media to television and radio to information from various print and online sources. We can’t keep up! Within the enclosure, the nuns give up this noise (and many other things) so that [Jesus] alone may dwell in the utter silence of the cloister filling it with His Word and presence… (Verbi Sponsa.) You may recall the story of Elijah sitting in a cave waiting to hear from God. A fire came by, and the earth shook, but God’s voice did not boom from either. Rather, it came as a whisper in the wind. That’s the voice that speaks to our hearts, if we are quiet and still enough to listen. So what is one result of cultivating silence in the monastery? Noise, any noise, begins to seem really loud. And it echos. Asceticism Lesson #1: How to silently open and close a door. Of course, most people are not called to live inside a cloister. But we all should try to carve out at least a little silence daily and invite Jesus to fill it. May we all experience the fullness of God’s loving mystery during this Advent season as we silently await the coming of our great King.